"There was a time when I experienced architecture without thinking about it. Sometimes I can almost feel a particular door handle in my hand, a piece of metal shaped like the back of a spoon." 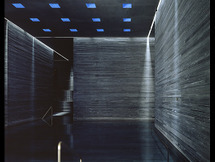 Peter Zumthor (born April 26th, 1943 in Basel) is a Swiss architect and Pritzker Prize winner. Zumthor has practiced in the out-of-the-way mountain village of Haldenstein, Switzerland, since 1979. 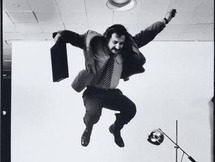 He is not well known to the public, but he is something of a cult figure among architects. He has a small oeuvre of elegant, austere modernist buildings, mostly in eastern and central Europe, that are exquisitely crafted and that celebrate the sensual aspect of materials—the feel of wood, the texture of concrete, the depth of stone. His work combines Louis Kahn’s mystical, quiet power with an almost Japanese restraint, and he exhibits a bit of Ludwig Mies van der Rohe’s extraordinary discipline as well. I’ve never thought of Kahn and Mies as having much in common, but Zumthor is the spiritual child of both. His work is brooding in the manner of Kahn, and pristine in the manner of Mies. His best-known buildings are a glass-walled art museum in Bregenz, Austria, finished in 1997, and thermal baths at Vals, Switzerland, from 1996, made of striated stone cut in the manner of Roman bricks. A couple of years ago, he finished an extraordinary chapel in Mechernich, Germany, made from more than one hundred tree trunks that were arranged like the ribs of a teepee, covered with concrete, dried by fire, and removed, leaving their imprint. The chapel is open to the sky, and it appears from photographs (I have never visited it) to have the spatial power of Richard Serra’s torqued ellipses. Zumthor thinks of architecture in terms of experience, not theory. He is more interested in how a building feels than in what dogma might lay behind it. In fact, there isn’t any dogma in his work, unless you consider a profound sense of form, space, light, scale, texture, and materials, and the ability to shape these things in a wholly original way, to be an architectural theory. It certainly is an architectural ethos. Every Zumthor building—there are not many of them, and there probably never will be—is different from every other Zumthor building, and designed to create an emotional experience wholly its own. There’s no doubt that Zumthor deserves the Pritzker. 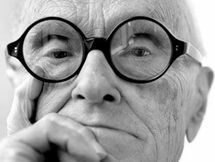 In fact, he’s the kind of architect for whom the award ought to have been conceived: a great creative force who deserves to be better known outside the world of architecture. Will it lead to more Zumthor buildings? Maybe, but that’s not the point. Winning the Pritzker should be less a career-development move than a punctuation mark of recognition, an acknowledgment by the world that someone’s work matters for everyone else. As we come to the end of an age when architecture has often seemed shrill and overblown, honoring Zumthor is a way of telling us, as much as anything else, that we ought to slow down and smell the buildings.